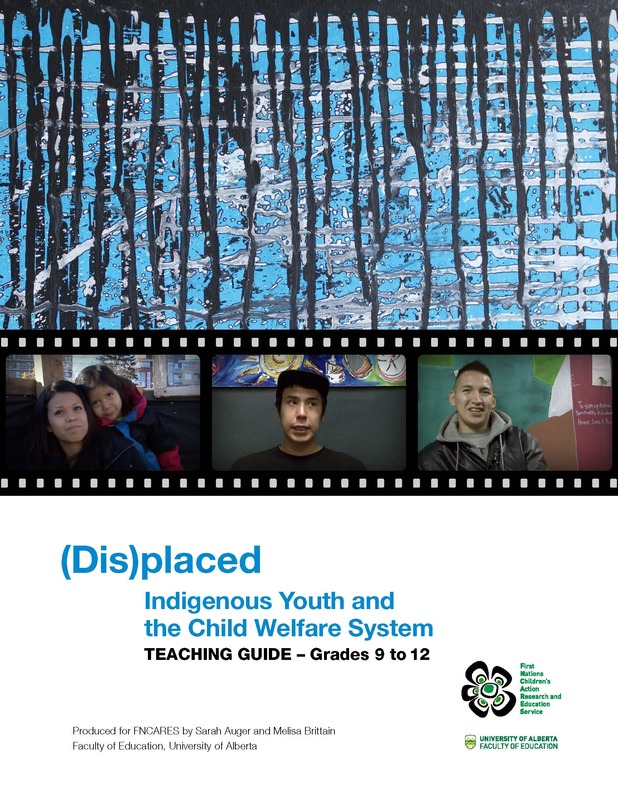 This teaching guide for grades 9-12 is designed to accompany the documentary film (Dis)placed: Indigenous Youth and the Child Welfare System. The film features the voices of Indigenous youth as they reflect on their prior involvement with child welfare and share their multiple strategies of resistance to assimilation and state control. The guide provides teachers with necessary background information on the connections between Canada's colonial history, especially residential schools, and the ongoing inequities experienced by First Nations children and youth. Questions and activities structured around four themed lessons will help students understand these connections, as well as the following: the role of family, community, and culture in identity formation and belonging; how art, storytelling, and the revival of cultural practices can be powerful sites of learning, resistance, and healing; and how they can exercise their citizenship responsibilities by taking action in an ongoing social justice movement that addresses the root causes of ongoing discrimination. This five-chapter literature review and analysis examines existing research on First Nations child poverty contextualized within the historical and contemporary manifestations of colonialism in Canada. dir. Melisa Brittain, 2017, 42 min. Closed captioned. Canada's colonial practice of forcibly removing Indigenous children from their families did not end with the closing of Indian residential schools. It continues today in the form of provincial and territorial child welfare systems, which remove Indigenous children and youth at unprecedented rates. This film features the voices of Indigenous youth as they reflect on their prior involvement with child welfare and share their multiple strategies of resistance to assimilation and state control. Adding to these insights, First Nations child advocate Cindy Blackstock traces the term 'neglect', the main rationale for child welfare removals, to its roots in the residential school system, and points to laws that codify structural discrimination as the leading cause of child welfare (dis)placements. Read more about the film at KingCrip Productions. This film is distributed by V Tape. There are special rates for community organizations, public libraries and high schools. This video shows the Q & A session with director Alanis Obomsawin and Cindy Blackstock following the FNCARES screening of We can't make the same mistake twice in Edmonton February 12, 2017. This stunning NFB documentary follows the Human Rights case launched against the government of Canada for racially discriminating against First Nations children. Click here to learn how you can watch We Can't Make the Same Mistake Twice (NFB, 2016, 163 min). In this short video, Cindy Blackstock explains the reasons behind the Human Rights complaint filed against the Canadian government for racially discriminating against First Nations children in 2007. Underfunding of child welfare and essential services undermines First Nations child well-being, but for 6 years, the federal government tried to keep the case from being heard. In 2013, the case finally went before the Tribunal. The Tribunal ruled in favour of First Nations children in January 2016. Indigenous adolescent development: Psychological, social and historical contexts by L.B. Whitbeck, M. Walls and K. Hartshorn (2014). This book is the result of an eight-year longitudinal diagnostic study of Indigenous adolescents and their families designed to address developmental, mental health and substance use issues and help communities design effective culturally-based prevention programs for adolescents in tribal communities. The study involved 746 tribally-enrolled adolescents from four American Indian tribes and four Canadian First Nations who were followed from early adolescence into early adulthood. In Chapter 10 (pages 116-125), the authors argue that every level of Indigenous adolescent development is permeated by the historical and current effects of ethnic cleansing, creating the unique historical, geographical and cultural contexts in which North American Indigenous adolescents grow up. They propose a distinct model of Indigenous adolescent development (see diagram on page 117) that can take into account the unique settings and cultural influences in which Indigenous adolescents are growing up, and they discuss each element in the model in the rest of the chapter. Racial Equity Resource Guide - Designed by America Healing, a strategy for working towards racial healing and equity, this interactive online tool helps organizations and individuals build their own resource guides for addressing racial inequity in their communities. Although designed in the U.S., the resources in the category of 'racial healing' could prove especially useful for Canadians as we continue to work towards reconciliation, and towards equity for First Nations children. Health of American Indian or Alaska Native Population - This website provides U.S. data on the "Health of American Indian or Alaska Native Population"
Click here to search the Caring Society's Indigenous Knowledge Portal to access annotated resources related to Aboriginal children and families in Canada and other settler-colonial nations. Article: Why is Canada ignoring the health of Aboriginal peoples? Poverty or prosperity: Indigenous children in Canada. Macdonald and Wilson, Canadian Centre for Policy Alternatives, 2013. Why am I Poor? First Nations child poverty in Ontario. Best Start Resource Centre, 2012.